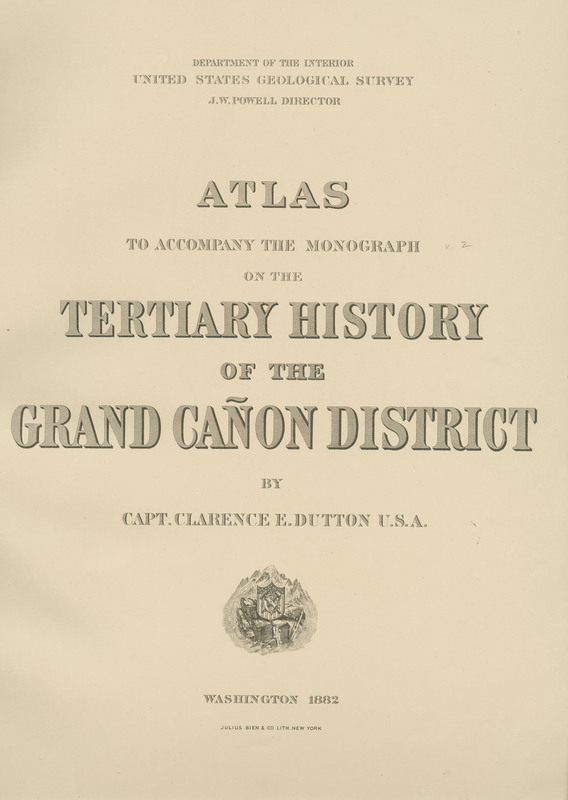 Dutton, Clarence E , “Tertiary History of the Grand Cañon District ,” Arizona 100: Essential Books for the Centennial, accessed April 21, 2019, http://speccoll.library.arizona.edu/online-exhibits-dynamic/az100/items/show/207. 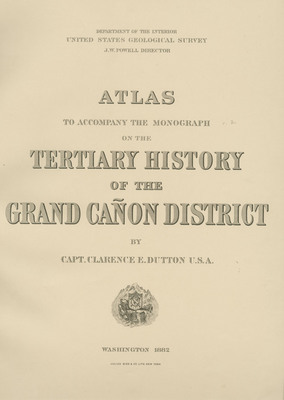 When Dutton published this book, geology was an infant science and Arizona was still a territory, but his study and story of the many eroded layers of sedimentary rock of the Grand Canyon and southern Colorado Basin Plateau are a durable blend of clear science, lofty prose, and landscape art. Dutton’s awe for the beauty and mystery of the colorful sandstones, limestones, and shales deposited during the Tertiary period helped form how modern visitors see beauty in bare Grand Canyon rock as he describes and explains, marvels at and extols the landscape. Washington, D.C. : Government Printing Office (atlas printed by Julius Bien & Company), 1882.
xiv, 264 p. : ill. ; 30 cm.